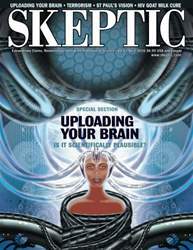 PETER KASSAN’S ARTICLE IN THIS ISSUE OF SKEPTIC argues that the idea of mind uploading is “science fantasy, based on a misunderstanding both of the overwhelming complexity (and our near-total ignorance) of the brain, and of what computer models are.” Do any real neuroscientists believe that mind uploading might be possible? Kassan’s article mentions one that does—me. So I have been given the honor to write this rebuttal. Any discussion regarding mind uploading must be about what can reasonably be assumed possible in the distant future, not what is achievable today. I am certainly not arguing uploading will be easy, or that it will occur within the next few decades; but I will argue it is a technically achievable, potentially desirable, long-term goal. I will present evidence that current neuroscience models support the possibility. I will cover recent developments in electron microscopy that hint at the technology needed. I will touch on cognitive models that directly support the mind-as-computation hypothesis, and I will delve deep into the consciousness debate. Finally, I will discuss a recently developed method for long-term brain preservation that seems sufficient to support future mind uploading, a fact that makes this discussion not merely academic. Hopefully we can all agree that it is physically possible to one day colonize the planet Mars with vibrant, self-sustaining encapsulated cities. And we can also all agree that such colonization would be incredibly difficult, requiring enormous resources and advancements. If colonization were ever to occur it is reasonable to assume it would take centuries. Reasonable people can disagree on whether Mars colonization is even a desirable long-term goal. They can also disagree on whether the first small self-sustaining colony will be achieved by the year 2050, 2150, or 3050. And they can certainly disagree on how best to prioritize today’s resources with respect to that goal. But it would be unreasonable to level unsupported statements that such colonization is physically impossible, especially in the light of our successful baby steps toward that goal (e.g., landing men briefly on our moon). And it would certainly be unreasonable to ridicule the scientists and engineers (e.g., those at NASA and SpaceX) who, motivated by such lofty long-term goals, have decided to devote their lives to tackling some of the technical obstacles.